In the supposedly unchanging eternal sky, ancient Chinese observers were drawn to unusual appearances: “guest stars” were portents of earthly events to court astrologers. Today, cosmic explosions and variability announce ever-stranger physical phenomena to modern astronomers, while improved observational tools illuminate intriguing new aspects of known systems. Supernovae, variable stars, gamma-ray bursts, and gravitational lenses are just some of the creatures of the transient Universe that LSST will reveal. 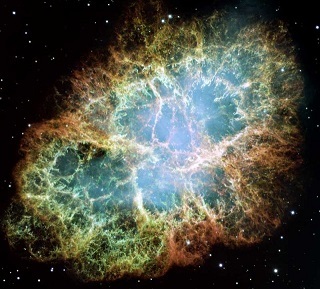 The Crab Nebula, the result of a supernova noted by Earth-bound chroniclers in 1054 A.D. Throughout recorded history, humans have observed the changing heavens: astronomical objects that appear suddenly and then fade from view, or that simply change their brightness over time. Though these transient and variable phenomena were once considered portents of disaster, we now know them as examples of time domain astronomy, or the study of our changing cosmos. The LSST will scan the sky repeatedly to great depth, enabling it to both discover new, distant transient events and to study variable objects throughout our universe. Its wide-ranging coverage will capture rare and exotic objects, as well as enable astronomers to gain new insight into known kinds of transient events. For example, LSST will reveal new remnants of dead massive stars, including neutron star and black hole binaries; it will observe variability at the heart of distant galaxies, teaching us about the feeding habits of the rapacious supermassive black holes at their centers; it will catch the faint cosmological explosions of dying, merging stars, illuminating where the universe’s heavy metals are forged. With its capacity to provide near real-time alerts to the community, the LSST will make sure other telescopes can get in on the action with additional dedicated observations in complementary wavelengths of light. The LSST will extend our view of the changeable universe a thousand times over current surveys. The most interesting science to come may well be the discovery of new classes of objects—the unimagined.